I still can’t believe she’s a freshman. So young, yet so old at the same time! Now I think I know how parents feel… kind of. I know that now, she’ll be thrown into a world far more different than middle school was. Middle school is like that treading ground where everyone is totally gawky, even the “cool kids.” Because even those “cool kids” will still be considered “fresh meat” when they step food on the high school campus. But now, she’s mingling with sophomores and juniors and seniors(!! ), taking multiple classes with lots of hard homework, going to homecomings (!!) and and and and… perhaps getting a boyfriend. High school relationships are funny. They’re so serious yet so silly at the same time. Of course, I’m speaking with 20/20 hindsight, but still. A lot of you may have married your high school sweethearts. My parents are. That’s awesome! But if you didn’t, imagine if you had. Ugh. Personally, if I married my freshman boyfriend, I’d probably still be listening to *shudder* Korn and taking 300 kissy-faced pictures of me to upload to MySpace. And if I married my sophomore boyfriend, I’d still be listening to punk music, wearing creeper shoes, and keeping JoAnn’s perpetually out of stock in the safety pin department. Gross. And even if I married my junior & senior boyfriend–which, we were serious enough it seemed–I’d probably be the unhappiest person alive. So I’m kinda sorta SUPER grateful I didn’t marry any of them. But hey, I’m sure they’re all wonderful catches to their current/future girlfriends/wives and that’s all that matters, right? I just hope that when and if my sister nabs herself a man, he treats her right. He’s bound to be slightly awkward, albeit awkward and adorable, and will probably have bad taste in music (ahem, Korn… really??) but as long as he doesn’t break her heart too bad, I really can’t complain if she takes up a liking for safety pins. 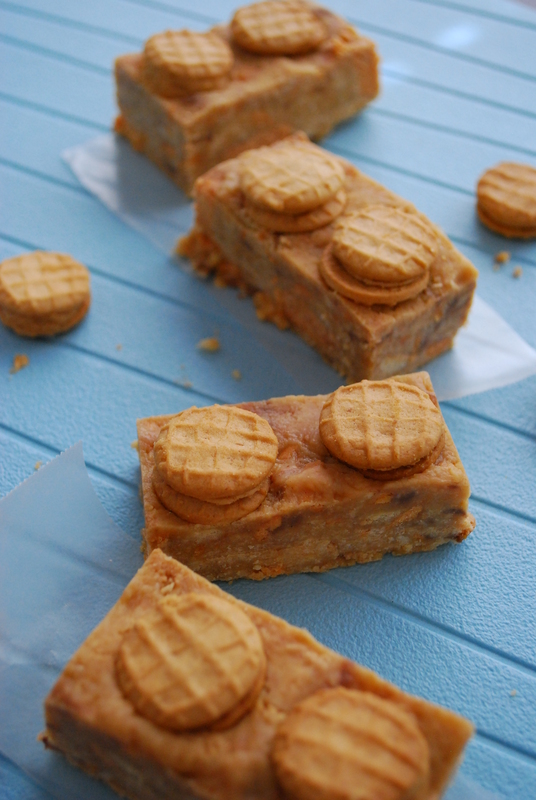 First day celebrations called for some tasty treats, so I whipped up some No-Bake Nutter Butter Peanut Butter Bars for the occasion. My sister loves peanut butter and Butterfingers happen to be one of her favorite candy bars. I knew these easy bars would be a hit with my pretty little sister and I was right! They take less than 10 minutes to make and are done in under thirty… including prep time. They’re chewy, crunchy, and dense, filled with tons of peanut buttery goodness and studded with chopped Butterfinger candy bars, then garnished with mini Nutter Butter cookies. They really can’t get any better, so why settle for anything else?? 1. Line an 8×8 inch baking pan with foil, extending the sides of the foil over the edges of the pan. Lightly mist with cooking spray & set aside. 2. In a large bowl, melt the PB chips in the microwave for 45 seconds, stirring until smooth. Stir in the milk to combine. 3. Combine the crushed cookies into the PB/milk mixture; gently fold in the crushed candy bars to incorporate. 4. Using your greased hands or a greased rubber spatula, spread the mixture evenly into the prepared pan. Top with miniature Nutter Butter cookies, if desired. 5. Place the pan in the fridge to set, about 20 minutes. Cut into squares and serve. Store leftovers airtight, at room temperature, for 3-4 days. These are super yummy and SO easy to make–as it’s still pushing in the 100’s here, I’m loving these no-bake recipes as shortcuts to beat the oven. They taste just like a candy bar, but are even tastier and easier than buying one! I hope you love them!! These are right up my alley – gotta’ try them because they look so darn good!! Wish you were my sister making these for me!! Lucky girl. I’m so glad I didn’t marry my high school sweetheart! High School can be tough, I wouldn’t want to go back. Of course I’ll have to return, as a parent this time! Yikes Great Nutter Butter bars. Nutter Butters are my favorite cookie! As someone who married their *MIDDLE SCHOOL* sweetheart AND listens to KORN, I have to say that I’m offended by your remarks. Just kidding. Not about meeting my hubby at 13 or liking Korn, but about being offended. It takes all kinds of people to make the world go ’round. If we all liked and did the same things, we’d all be bored out of our minds. I do agree that these look FANTASTIC and I really need to try them. Nutter Butters are one of my faves! My fave is “Tearjerker”, personally. Oh, and anything from “Queen of the Damned”! 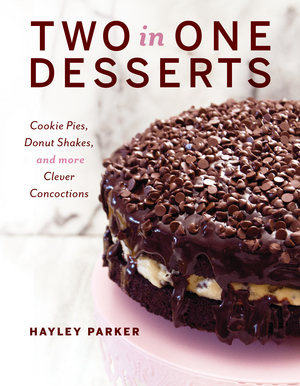 Hayley, do you think you could come over and bake for me for a week? Because that would be amazing!! These are incredible! Pretty sure I would make my husband’s week if I made these for him! Hayley – your sister and I have a lot in common… I’m a butterfinger FAAAAA-REAK. And pb too, of course!! Wishing her the best of luck in HS! You can do practically anything with SC milk! One of my favorite secret weapons in the kitchen for sure! I love all the bar/blondies you’ve been making recently! Your sister and I have a lot in common! I am a butterfinger faaaa-reak! And PB too, of course. The no bake idea, love it obviously. And SC milk is my saving grace in the ktichen – one of my favorite secret weapons! Good luck to your sis in HS this year!! Thanks Sally! I know she’s gonna rock it 🙂 and I love SC milk too! It’s the best! 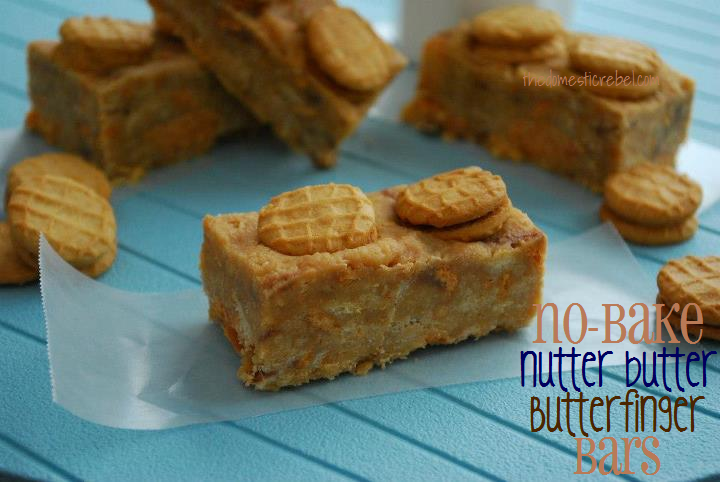 years ago I made some Nutter Butter no-bake bars and these make me crave them! They look sooooo good! Nuttter Butter AND BFinger… YES!!! And a can of SCMilk. Love this! YES! You combined both of my faves into one fantastic bar! Also, I DID marry my HS sweetheart and that lasted a year…..so not one of the best choices in my life. Later on though, I married the boy next door (literally lived next door) who also happened to be my best friend and we celebrate 9 years of marriage this November…some things are just meant to be, and some aren’t. Awh, Lori–that’s sweet! You never know who will end up being the one, and while there are times when that’s so frustrating and could save a lot of time, money, and heartbreak, it’s kind of cool not knowing that the literal boy next door would soon be your hubby! Congrats!! 10 minutes and then I get to eat THIS?! I’m IN! these look so good. i totally think i drooled a bit! 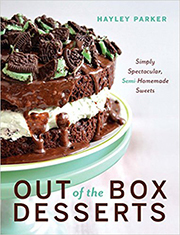 This recipe is genius – and it’s inspired a fresh new wave of ideas! Totally awesome, as well is your sisters start of HS. I hope she had a good week! Ugh, I shudder to think about what my life would be like if I married who I dated in high school. Scary! Totally not scary? 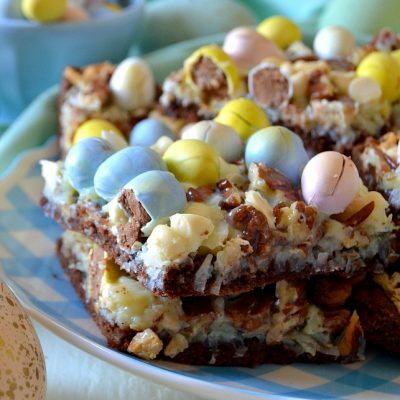 These butterfinger bars–butterfingers just so happen to be one of my fave candy bars (along with Baby Ruth), so yeah, I totally need one or three of these! Butterfingers are my favorite candy and nutter butters are my favorite store-bought cookie. Making these is a MUST!! Aw, lil sis is growing up. My brother is 5 years younger than me and to this day I still sorta think of him as a 12 year old kid. But now he’s married – not to his HS sweetheart. Crazy! These bars are awesome. You are so creative, girl. Seriously in awe of you daily! Butterfingers are my favorite!!! Love these. I can’t wait to try these – I lllllove butterfingers! And it’s totally bittersweet to have a baby sibling start a monumental shift in life… I’m sure she’ll do amazing! What if I married my high school BF? I’d probably still be shopping at Hot Topic, have a bob haircut colored a la Gwen Stefani, and would probably attending the Warped Tour. Holla. Sooo….I’m allergic to chocolate! No idea what a Butterfinger tastes like. What do you suggest adding instead? Would a white chocolate Kit Kat work? Or Zagnut? Hey girl! Yiiiikes, thank goodness you passed on that HS sweetheart nightmare! Eek. As far as chocolate candy bar replacements, the white chocolate Kit Kats would work awesomely methinks! And Zagnuts would be a fun twist. Try ’em with both! FYI, Butterfingers are like PB wafers inside coated with chocolate, so I think either KitKats or Zagnuts would work perfectly. OMG, these sound so good. They are something I’ve never seen. Great post and recipe! Pinned and tweeted. I should have known this was your wonderful creation when I spotted it on Pinterest! Hope your sister is doing well in High school and make sure your dad has the shotgun out (just for display purposes of course.) Repinned. Just made these today and i think we have a new favorite family treat in this house! how long do these stay fresh for? i have a dinner party on thursday and don’t think i’ll have time to make them other than wednesday morning. they look amazing 🙂 i wonder if there is anyway to lighten them up though? do they make reduced fat nutter butters these days? Hi Sara! These will definitely be okay Thursday night if you make them Wednesday morning. Just keep them airtight at room temperature. I’m not sure if they make lightened-up Nutter Butters nowadays (I haven’t seen them!) but you can use fat-free sweetened condensed milk instead of the regular kind! I just made these twice. Once melting chips in microwave and a second time melting chips in a double boiler. Both times when I added the scmilk itchanged from smooth to a thick dough like consistency. So when i added the cookies then butterfingers it was just a crumbly mess. Any suggestions on what i did wrong? Hey Darla! Unfortunately, it’s hard for me to say exactly what went wrong without being there, but I do remember the dough for these bars to be quite thick and somewhat crumbly. Once you added the scmilk, I remember having to mix it really good to wet all those crumbles and then press it firmly into the pan. I’m sorry you were having such poor luck with these guys–thanks for the heads-up! I used a double boiler and then turned the stove to low while I continued chopping the cookies & Butterfinger… not using the food processor was a bad decision! Anyway, I slowly poured the condensed milk and while it did change the consistency, it was not dough like, but just thicker and grittier, almost like I had stirred in nuts or coconut. It was difficult to fold in the cookies but I did so a little at a time. Maybe you didn’t use a whole can of condensed milk? Maybe the chocolate had hardened back up? Hi Sara! If I remember correctly, I believe I did use an entire can of scmilk (14 oz) and the texture was a bit more grittier from the crushed cookie crumbs. I remember needing to work quickly before the chocolate set up, but eventually, a hard dough-like consistency came together and I was able to press it into the prepared pan and let it sit for a little. Did the bars turn out at all for you? Maybe I need to reformulate the recipe; sorry that you had problems!! The only size cans that were in my grocery store were 14 oz. Did you just use half a can or is it a typo? What is the point of tin foil? Does it matter if you use it? Just curious!! Hey Jen! The purpose of the tin foil is to easily lift the bars out from the pan. However, if you don’t have any foil on hand, just spray the heck out of the pan with cooking spray. Hi Embo! 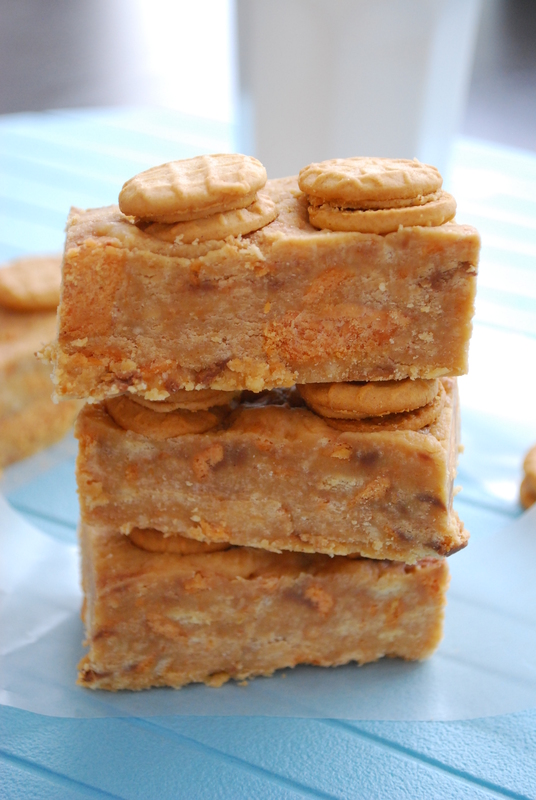 Nutter Butters are peanut butter flavored sandwich cookies with a creamy peanut butter filling. They’re really yummy! Sadly, I don’t know a comparable cookie in the UK, but hopefully this description helps you some! Any peanut butter cookie with a peanut butter filling should work in place of the Nutter Butters. Ok these are rediculous. REDICULOUSLY GOOD! They are super duper rich but yuuuuuummy!!! I’m splurging a lot of WW points for them but they are a nice treat and I promise to share. I’m thinking of adapting them with Biscoff cookies in place of the Nutter Butters and Biscoff spread in place of the peanut butter chips and maybe some roughly chopped biscoff cookies in place of the Butterfingers… Anyways, I found ya via Pinterest but I’ll be followin’ ya now for sure. Jen, I LOVE your Biscoff idea adaptation! Totally genius. Glad you liked them!! Can you substitute peanut butter for the chips? Hey I was thinking of using Reese peanut butter cups instead of butterfinger, any opinions? My only opinion is that sounds AWESOME!! Just chop those cups up into little pieces and you’ll be fine! 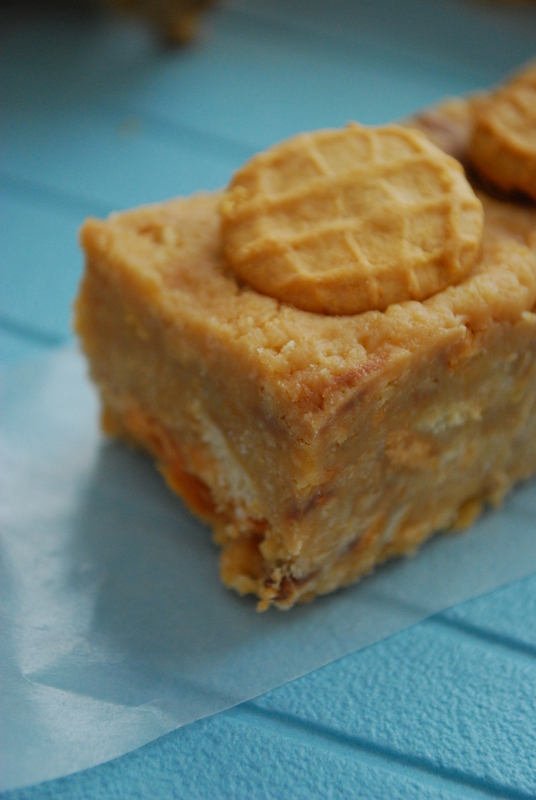 Can’t hardly wait to make these ….. but arrrggghhhhhh everything but PB Chips….. any ideas?? White chips with some PB added?? I have everything else. Thanks much! !